Interfaith Design’s Knowledge Resources Committee is pleased to present a series of monthly case studies based on selected award winners from the annual Faith and Form/Interfaith Design International Religious Art and Architecture Design Awards. Please enjoy and share! The rolling hills of the northern Ohio Valley, along the western Appalachians, are home to some of the oldest farming communities in the United States. St. Mary’s Chapel, in the rural hamlet of Lafferty, emerges from one of those hills, comfortably residing as a contemporary piece of architecture rooted in its place. When fire consumed the previous St. Mary’s Church, the Catholic diocese engaged Columbus architect Greg Dutton to return to his boyhood home and create a chapel to replace it. Dutton, one of the partners of Columbus and Pittsburgh based Midland Architects, grew up on a farm in the area and attended St Mary’s parish often. In the new chapel building, he expresses a practical-minded familiarity with the landscape and surrounding agricultural communities. 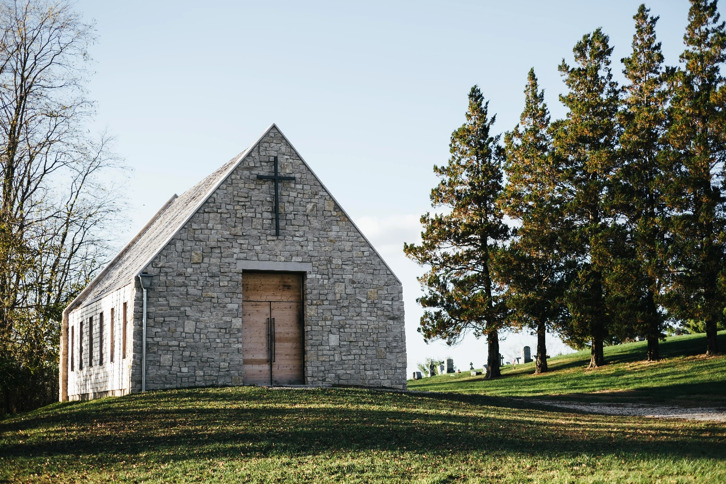 The simple steep-pitched gable-roofed building reminds one not only of the archetypal form of a church but of a building itself: sheltering, familiar, and comforting. The material palette is uncomplicated and elegantly executed and detailed. 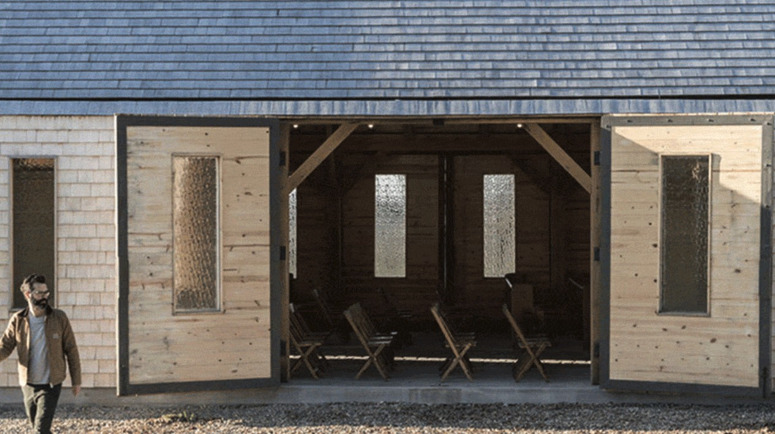 The exterior sidewalls are cedar shake siding, and the end walls are of gray limestone laid in a semi-random pattern that recalls the rustic practicality of the region’s agrarian buildings and evokes the image of 19th-century farmers gathering and stacking the stone that they could reasonably gather nearby. The entry doors and opaque transom of solid knotty horizontal planks, outfitted with tall dark bronze door pulls, hint that this building might not have been here for a century or more, as it appears at first sight. As the program for a new chapel called for a more modestly scaled building than its predecessor — not required to be the full-time home to a parish — natural ventilation was chosen to cool the space in warm weather. This is achieved in one of the most compelling features of the building: hidden doors in the sidewalls that can be flung open to allow breezes to temper the air in the space while also opening to views of pines in one direction and the valley the other. The ecclesiastical effect of opening these vast opposing pairs of double doors is to suggest natural transepts uninhibited by end walls, reaching out into the landscape. 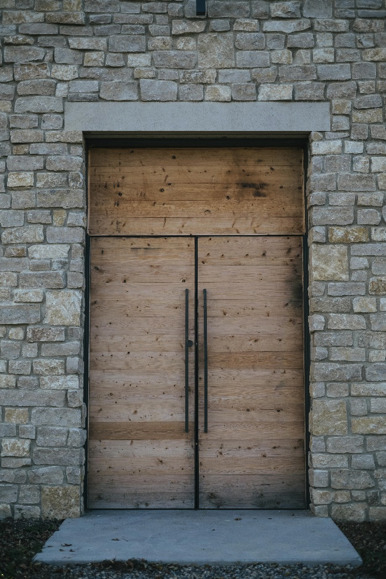 Stepping inside the gathering space reveals a heavy timber frame of white oak, influenced by the many barns Dutton spent time in as a child. The frame was raised in a single day by local Amish craftsmen with church and local community present. The narrow windows spaced along each side evoke a church, yet are modest obscured amber-colored glass. 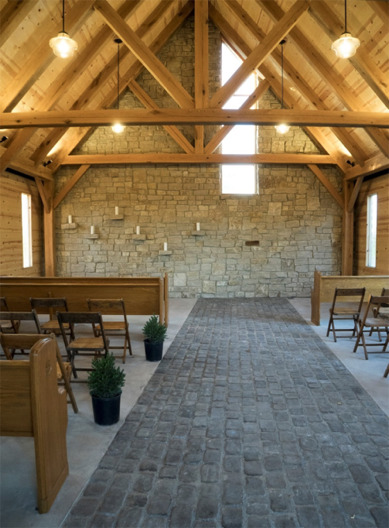 While the barn-inspired frame is familiar and expected, the center aisle, rendered in bricklike stone pavers, is shifted off-axis to the right and terminates in a tall window that engages the slope of the ceiling. Where the single high window in the stone end wall lifts the eye, we are re-grounded by a horizontal composition of several rustic ledges emerging from the wall to allow for candles. The asymmetry of the space is a simple surprise that reminds us the divine can manifest in delightful and unexpected ways.